I knew I had to write the family history; no one else was going to do it. My father and his third cousin Stella Layton (née Rowland) put together a tree back to Alexander William Rowland and John Henry Rowland, who together ran the Macassar Oil business, and who were thought to be twins. Without this, my task would have been very difficult although not impossible, given centralised English birth, marriage and death records and censuses back to the 1840’s. I was encouraged by my second cousin Martin Gibbs, who could not wait to retire to write his memoirs, Anecdotal Evidence, and his family history, Seven Generations of Gibbs. He introduced me to Ancestry.co.uk and then made a huge breakthrough by locating an entry in the History of National Biography, taking the tree back to William Rowland, baptised on 4 April, 1710 at St Andrew’s, Holborn. As he modestly said, this has done all the work for you. But he had not anticipated the good work of the Church of Latterday Saints! Also I came across a learned and interesting paper online, The Good Oil on Bryon and ”thine’incomporable oil,’ Macassar!” by Leslie Katz. He has been able to incorporate some of my researches. I am greatly indebted to the Mormons via their free www.familysearch.org for enabling me to locate five earlier generations going back to Thomas Rowland, stated as the father of Thomas Rowland at his baptism on 7 February 1619 in Monkton, Kent. I am aware that genealogy is not a perfect area of research and that I do not have secondary corroboration for some of these early Rowlands, but remarkably the ages fit, if the baptism date is not taken as the birthdate. The Gibbs family has also spawned a number of memoirs, The Pageant of the Years, by Sir Philip Gibbs which I quote in relation to his courtship with Agnes Rowland, and his father-in-law Rev William John Rowland, his son Anthony Gibbs, In my Good Time, and Martin’s brother-in-law, Ian MacElwaine’s, Now it Can be Told. Also my father’s first cousin Adrian Harbottle Reed has produced his memoirs. Sadly I was unable to discuss these with him before he died-rather proving that nascent family historians should interview elderly relations as soon as they can. Recently Angela Hodges from Stoke sub Hamdon has produced some interesting papers about Rev William John Rowland and his bacteriologist son, Sydney. She has written a paper with Dr Wever for the JR Army Medical Corps describing the WW1 years of Sydney. Alexander William Rowland wrote a number of travelogues, which I quote, but otherwise the Rowlands did not produce memoirs. Even the formidable Dame Henrietta Barnett wrote two volumes on her husband, Canon Barnett, but none on herself. She did keep a diary but it is missing. Her biograthers, Alisnon Creedon in Only a Woman, and Mickey Watkins’ work paint avery full picture of her, and her childhood in the Rowland family in Sydenham, which I quote. I now live when in London very close to Dame Henrietta’s home in Hampstead garden Suburb. I am delighted that her vision has produced such a pleasant oasis for my retirement. My fourth cousin Mike Rowland was able to produce some early documents relating to the Macassar Oil business which then belonged to the Sussex side of the family, so I was able to trace the ownership of the business. My first cousin Sally Rowland, who has now retired as a nurse in Norwich, had inherited a cache of family papers, including Alexander William Rowland’s accounts book from 1868, and the school reports of my grandfather William Domville Rowland. It is a pity that there are no portraits of the 19th century Rowlands. Mike Rowland produced a copy of an early photograph, possibly Alexander William Rowland, or maybe his brother, John Henry Rowland. My parents had a pastel portrait of Henrietta Ditges, Alexander William’s wife over their mantle piece for many years. They also had a coloured photo of Dr Jones Domville, brother of Anne Ellen Domville, wife of Rev William John Rowland. I had it in my Victorian furnished rooms at 21 Silver Street, Cambridge-we thought he was an Admiral-in fact he was Inspector of Hospitals to the Fleet, a post he shared, by complete coincidence with Reginald Charles Thomas Scott, who owned the Isle of Vaila in Shetland which I acquired in 1993 with my second wife, Dorota. I was able to add the Domville branch to the family tree from extensive records posted online. These enabled me to include the Munchausen like stories relating to the 4th Lord Santry and his cousin Sir Compton Domville. My mother’s family, the Cowderys has a tree going back to the late 19th century; my Aunt Margaret Pollard (née Cowdery) who emigrated to Canada in the 1950’s has done much work assembling this, including information about other cousins in Canada. I hope that maybe my cousin Nick Cowdery might find time to trace the Cowderys back to their possible Huguenot roots. An interesting branch relates to my grandfather Arthur Reginald Cowdery’s first cousin Edith Harriet Cowdery who married into the Batty family; their son Ronald Batty (my mother’s second cousin) married Christina Foyle, who was the daughter of Daniel and Christina Tulloch, a well known Shetland name, thus giving us a rather tenuous Shetland connection. Mervyn Tulloch from Canada has been very helpful in tracing the Tulloch line back to the 18th Century. I have asked through the Shetland Family History Society for current descendants to come forward. My mother’s cousin Mary Cherry had done much work on the Mawle tree of solid yeoman farmers and successful ironmongers in and around Banbury. Similar the Adcocks came from farming stock in Leicestershire and Oxfordshire, before emigrating to South Africa; Cherry’s cousin Denise has done much work putting the tree together. Cherry’s mother Marthe Adcock (nee Barbezat) (Barbie) had no tree at all when I started what proved to be a fascinating search. We knew Barbie’s father had disappeared, but the circumstances turned out to be larger than life. Cherry’s first cousin, Marianne Cuenoud Golay has been very helpful assembling the tree. I am very grateful for the support and help from my first cousin Pennie Astbury, and her husband Robert, for creating the trees in a consistent, and hopefully understandable format. Since publishing the first edition, the greatest help has come from my third cousin Jacky Fogerty in Australia. She picked up references from my website to our common great great great uncle Frederick Alexander Arthur Rowland. Jacky has a vast tree on Ancestry.com with some 4,000 entries stemming from FAA Rowland’s son Percy Fritz Rowland who emigrated to Australia and founded a dynasty there. Through her skills in tracing relatives she has greatly enriched our family history. Last but not least I am also very grateful for Paul Mason’s aka Maximus Throttle’s help in designing this tome. Family group, Tan House, September 2012 Ben and Philip’s 40th birthday. 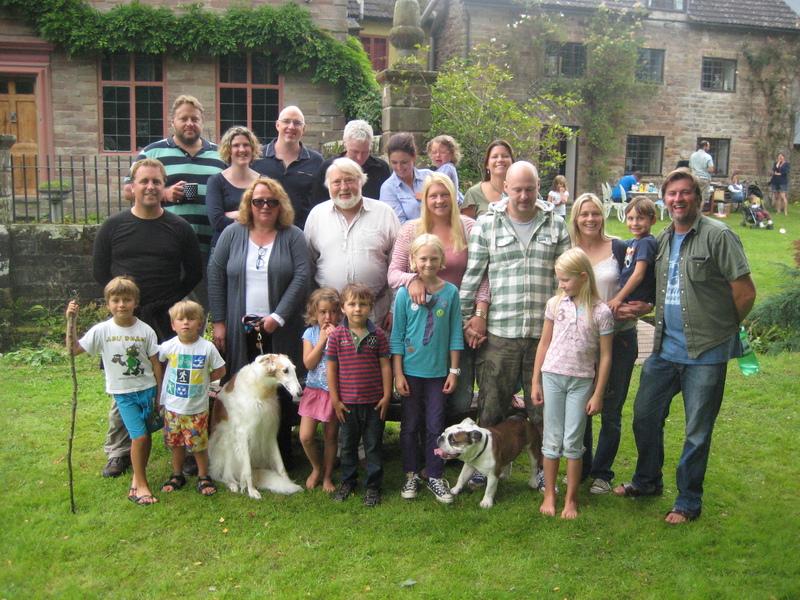 Top row: Edward Cowdery, Tessa Bonser, Philip Rowland, Richard Bonser, Eva with Vicky Rowland, Rachel Curtis (nee Adcock). Middle row: Simon Curtis, Dorota Rychlik, Richard Rowland, Julia Cowdery, James Cowdery, Cassie with Arthur Rowland, Ben Rowland. 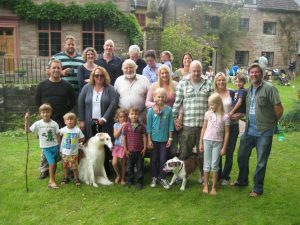 Front row: Luke Curtis, Alexander Curtis, Olga, Kristina Rowland, Johnnie Rowland, Lily Cowdery, Sebastian, Caitlin Cowdery.